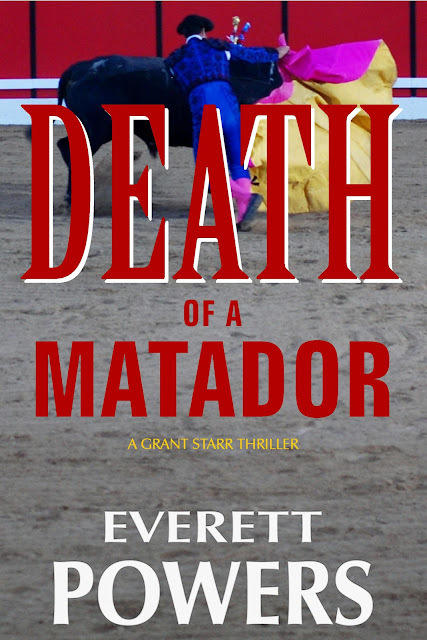 DEATH OF A MATADOR, my new Grant Starr thriller, is set to release, in ebook form, on October 16 on Amazon. 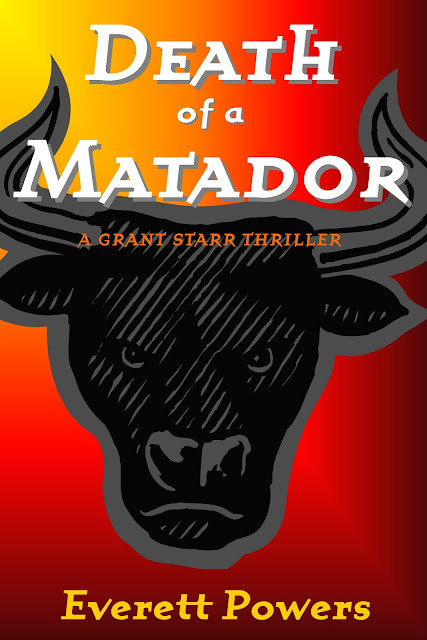 I'm in the final stages of editing and formatting for the ebook, and I have what I think will be my book cover. Like my first two novels, CANALS and THE MIGHTY T, the cover image was created on MicroSoft Publisher. It's not real fancy but I think it's not too bad for a do-it-yourself job by a guy who doesn't own a true graphics program. Much has been written about the importance of book covers these days. If you look at the covers of most of the "classic" novels, they're plain by today's standards. I think this cover has enough bold elements to capture a potential reader's attention for a few seconds. The cover typeface is Quartet, designed by Suzana Licko. I bought it from Emigre back in the early-to-mid 90s, but after a quick check on their site I see they no longer sell it. I've read it's important to use typefaces you own, meaning you paid for them. I've also read you shouldn't use typefaces that come with your computer, like the MicroSoft typefaces on my new Dell Windows 7 machine. I don't know if this is true or not, but all the typefaces I've used in designed my books are ones I've purchased. What do you think? Honest opinions are appreciated. I took the photo at a bullfight I attended in Central California, so I own it's rights free and clear. I think this cover have better graphic elements than the first, although the first may be bolder. Honestly, modern covers tend to be overdone. I do like the cover for my YA fantasy, but I requested something much more simple. The timeless books carry simple, yet eye catching covers. Do you see how easy it is to point out pop-fiction from the 80s but in the 80s those were the books people flocked toward? Now, it is easy to walk past knowing the freshness of the book has expired. That scares me. I do love the simplicity of your cover. Gives it the ageless appeal which I think most authors and readers prefer. The images and text seems a slight bit off balance, but so am I- maybe that is just me. I would work on the title. I think it is too spread apart. Maybe a large rough font for DEATH and something more simple and a bit smaller for the rest of the title. Either way, I would push the spacing closer. Overall, as I said, I love the solid simplicity of the cover. Bravo.